Teaching Idea – Forcing Bulbs – ScienceMan! Fill with water until it just touches the bottom of the bulb. Put the glass in a cool, dark place, about 10-15 degrees Celcius until roots form and a shoot begins to emerge from the bulb tip. 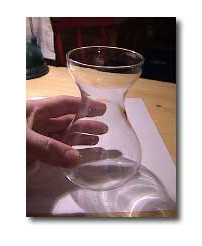 Move the glass into the light and maintain the water level – enjoy the bloom! You’ll have to be patient. The “cooling time” is general about 10-12 weeks. 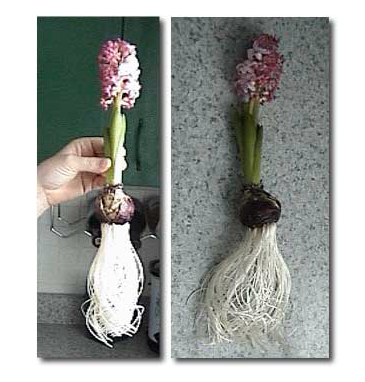 You can do this with other bulbs as well, but hyacinths are generally the only ones that work well with water only – others such as crocus, daffodils, tulips usually need soil. Narcissus can grown using the same method, just substitute a shallow pebble-filled dish for the glass.Want to buy great bulbs? Visit the Vesey’s site and get them to send you a catalog!